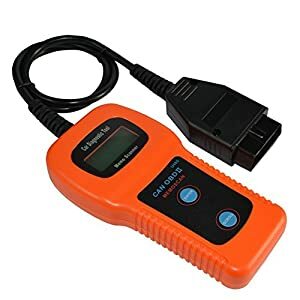 5 Best Car Diagnostic Tool Review: List of Top-Rated in 2019! Car Diagnostic Tools List: Compare the Most Popular, Choose the Most Functional! I’ve been driving different cars for many years, and, to be honest, I used to check only petrol, oil and tires before a ride. Until the day I struggled within a desert. The engine of the car I rented got broken and there were no chances to repair it by myself. A few days later I had a conversation with my old pal, who is an owner of Car Alarm Service Company. He told me about car reader tool or so-called OBD II (On-Board Diagnostic Level Two). This thing can define many problems and damages and prevent many uncomfortable situations. Or, in some cases, give you explicit information about what happened, so you can call your friend or any service providing them with the full list of needed tools and spare parts. Below you may find a review of five popular OBD II devices, describing features, pros and cons for each of them. 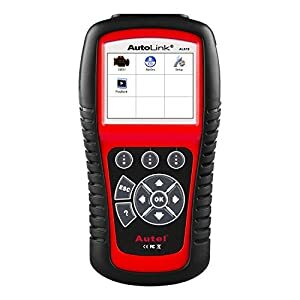 This AutoLink device is able to determine the reason of Check Engine, ABS, or SRS warning icons being highlighted. It works with over 50 different automobile manufacturers, and your car is likely to be in that list. To use this device you need to install a software from Autel website. There you can also download updates to be sure is supports newer vehicles and provides improved features. With the help of push buttons you can easily navigate between ABS, SRS, Ready Test and other Menu icons. English/Spanish/French languages are available. If your vehicle was made in 1996 or later by American, European or Asian automobile manufacturing company, Autel AL619 OBD2 Scanner would work with it. For non-CAN vehicles, the scanner provides monitor tests. And if you have a CAN transport, you would be able to check PowerTrain Components. The scanner provides diagnostics of engine, ABS and SRS system codes. It can access the electronics and retrieve generic (P0/P2/P3/U0), manufacturing specific (P1/P3/U1) and some pending codes. You may read or erase codes as well as view live/freeze frame data. And if you need to turn off MIL/ABS/SRS warning lights or reset monitors as soon as possible, this scanner is able to assist. The CP9670 AUTOSCANNER model by Actron is known as quite functional and affordable. Besides numerous options and user-friendly interface, it has such useful features as a backlit display. 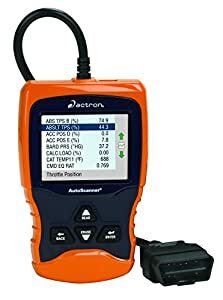 Actron CP9670 is considered to be the best cheap code reader by many mechanics. It has easy-to-read color LCD-screen and intelligible menu (one of three languages can be chosen as in a previous item). However, the tool is widely used at the counter (for the service writer) in order to run fast diagnostics within incoming cars, it can be also kept in customers’ garages. This autoscanner recognizes CAN and TrueLink Technology, so any vehicle made in 1996 or later, using these technologies, can be scanned. It is able to populate automobile’s VIN number, model and year when it was produced. If you have Ford, Chrysler, Hyundai, Toyota or Honda, this device would be a perfect choice. Actron CP9670 displays both generic and manufacturer DTCs and specific (not always clear initially) definitions. It can interpret ABS and powertrain codes, check emissions drive cycle mode and erase DTCs. It also has an ability to display and record (and then even play) live data, so you can view which component has problem in real time. The tool will be ideal for beginner mechanics or DIY drivers, who wants to save some money and don’t drive to car service at every engine light blinking. This device is able to erase engine light code so you would see whether it returns or not. In some cases, it’s just a little glitch. This U480 Code reader tool by Generic is quite compact and reliable. It connects to the car via OBD cable and doesn’t require any batteries. The scanner can fit in your hand or pocket. It is enough to have one plug-in and twice push to start scanning. With easy-to-read display (backlit can be enabled) you can easily identify codes and errors. It comes as a stand-alone unit so no laptop connection is needed. In the same time, it arranges communication with the onboard computer in a safe mode. Like other OBD II tools, this one works with made for U.S. 1996 and newer cars great. it works with CAN protocol and is able to determine VIN on automobiles that were made after 2002 and support Mode-9. 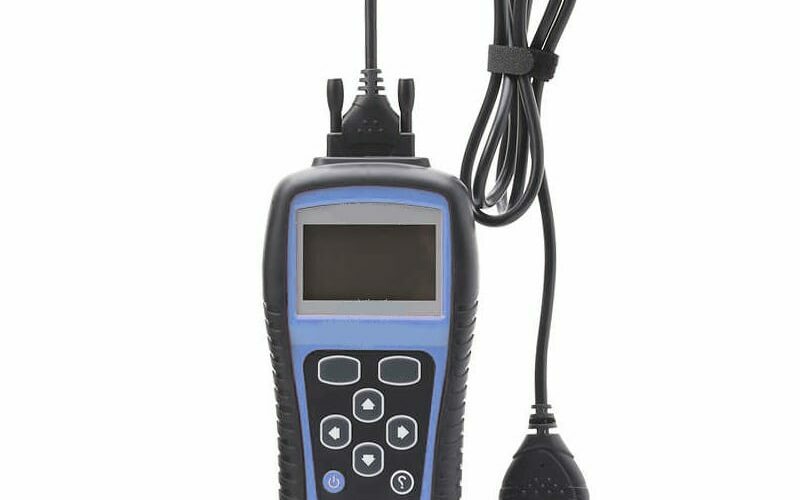 Generic U480 Car Diagnostic Scanner can read and clear DTCs (Diagnostic Trouble Codes). It is able to decipher both generic and specific codes, which were integrated by manufacturing company engineers. All available codes are described in code reference book. The tool also allows driver/mechanic to turn off check engine light. This one is mostly for professionals. Although it has quite detailed guideline and hot keys, common customers would need a lot of time to learn all the terms and advances features. The tool is most effective when used in a garage or car fix station due to computer connection (in this case you get more information then available on the tool’s screen). It is supplied with USB cable and link to software that should be downloaded on your PC or laptop. All diagnosed information displayed in one screen so you can check is state emissions ready and verify drive cycle. INNOVA 3160 device is compatible with all cars that were produced after 1996 for usage in the U.S. and Canada. You can try it on light trucks, SUVs, and minivans as well (C.A.N. technology is also supported). What is more interesting – this tool supports OBD I and is able to scan some older models like Toyota/Lexus (1991-1995), Ford/Lincoln (1983-1995 with EEC-IV system), Chrysler/Dodge/Plymouth (1984-1995) and Jeep (1993-1995). This auto scan toolis able to diagnose ABS/SRS codes (generic and manufacturer specific) quickly and accurately. SAE enhanced Live Data and OBD2 Freeze Frame Data can be shown in reports or graphs. You can also record and then playback this information. Turning off “check engine”, ABS and SRS lights can be done in two steps. The main feature of this device is an ability to synchronize with an app, which can be downloaded to iPhone/iPad. So you can view received information on the screen of your iOS gadget. To use this device firstly you need to install the app, mentioned in the guide. Then you should plug the tool in the OBD-II connector. After engine started you will be able to catch Wi-Fi signal and connect the scanner with your phone or tablet. The last step will be to run the app so you can read all the data in real time, and no additional settings needed. The scanner works with all OBD-II protocols ISO15765-4(CAN), ISO14230-4(KWP2000), ISO9141-2, J1850 VPW and J1850 PWM. 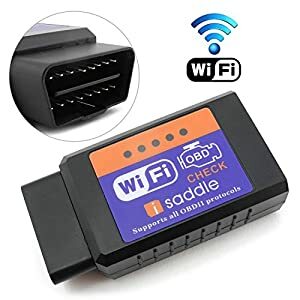 If you have Ford, Chrysler, Honda, Toyota or VW model with 16-pin DLC (Data Link Connector) under the dash and the Vehicle Emission Control Information Label, you may be sure that iSaddle Wireless OBD2 Scan Tool definitely fits your car. You can use this scanner to diagnose/erase trouble codes, detect fuel pressure and fuel system status, coolant temperature and air flow rate. It can also check Short and Long Term Fuel Trim, Intake Manifold Pressure and Oxygen sensor voltage. More than 3000 generic codes and their definitions are provided. 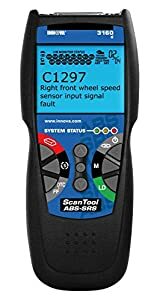 I hope you will find this automobile code reader review helpful when choosing the best tool for your car or for your job. Please don’t forget to compare advantages and disadvantages of the devices reviewed in this article.